As such, the BW.com domain name sale is unconfirmed, and I do not know what the asking price was or what the sale price was if it sold. The BW.com domain name has an interesting history. Using the DomainTools Whois History Tool, I was able to see that the domain name had been registered by a company called British American Tobacco (Brands) Inc. as late as June of 2014. The oldest historical record I could find dates back to 2001 when the domain name was owned by a company called Brown & Williamson Tobacco Corp., although the domain name was created long before 2001 – back in 1993. According to the R.J. Reynolds Tobacco Company corporate website, BAT acquired Brown and Williamson in 1927, so even though the Whois information changed a bit over the years, it appears that the domain name remained under the same corporate ownership. At the present time, the domain name is owned by an entity based in Shanghai, China. On August 7, shortly after the time of the initial sale listing on DNForum, the domain name showed what appears to be a different registrant, also based in China. At the present time, the BW.com domain name does not resolve for me. when I visit the www. version, a “403 Forbidden” message is shown on the landing page. 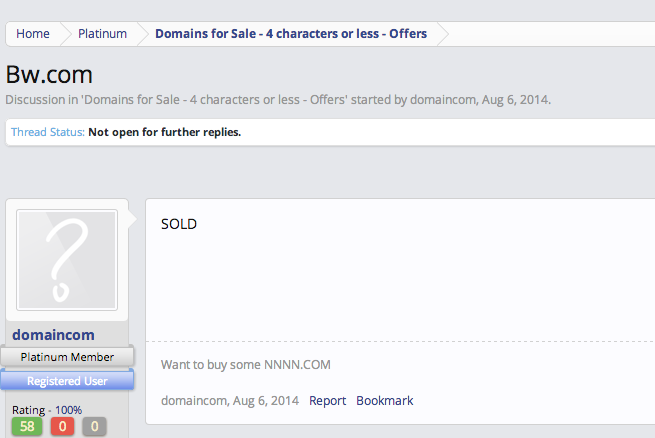 If BW.com was sold on DNForum, my guess would be that it was one of the largest deals consummated there. If I learn anything else about BW.com, I will update this article. I reached out to the Whois contact and previous Whois contact to ask for details, but I did not hear back. I also sent a message to the person who posted the thread on DNForum, and I did not hear back via DNF either.